Recent writings underscore an important hole in economists’ knowledge base: we know neither the natural rate of unemployment nor the potential level of GDP. I mean, we’ve got estimates for days, but an honest confidence interval around them renders them useless as policy guidelines. This post is about a related number that we don’t quite have right, either, one I wrote about a couple of years back: the jobs breakeven level (BL), or the monthly, net change in payroll employment that’s consistent with a stable unemployment rate. Though not as big a deal as the “natural” rate of unemployment, to which it’s closely related, the BL is an important piece of datum that provides insight into one of the most important questions in econ policy today: how much more room-to-run exists in the job market? Back in mid-2016, when I was writing about this, economists thought the BL was roughly between 50,000-100,000 (note that this SF Fed analysis uses a natural rate of 5%, clearly too high, and one way to underestimate BLs). In fact, I wrote my piece to warn people not to be too worried if monthly payroll gains started coming in well below 200,000. Though I hedged my bet in a way I’ll get to in a moment, the dominant argument was that gains of around 100,000 were consistent with stable unemployment in the mid-4’s—the lowest rate thought to be consistent with stable inflation—along with labor force participation and working-age population growth around where they were back then. This prediction now looks off. For the past six months, the jobless rate has held at 4.1% while payrolls are up an average of 211,000 per month, on net. Why hasn’t faster job growth led to lower unemployment, as most economists would have predicted a few years back? The answer must be that there’s more labor market capacity than folks thought there was. Here’s one, simple way to look at it. …where PR is payrolls, EMP is employment from the Household Survey, LF is the labor force (so EMP/LF = 1 – unemp rate; because EMP/LF + UN/LF = 1), and Pop is the working-age population (LF/Pop is thus the participation rate). Cancel everything out and you’re left with payrolls, which you can difference to get your monthly BLs. If you think we’re pretty much at capacity, then your BL is solely a function of your expectations about population growth. The first line of the table below shows those numbers in May 2016, when I wrote my post. These generated a BL of about 100K. But if you think the jobless rate might fall further or the labor force participation rate might rise, then you’d predict higher BLs. In one scenario we ran from the earlier post, we predicted BLs of 200,000, based on an unemployment rate of 4% and LFPR of 63.5%. Before I pat myself on the back for that prescient forecast, recognize, that as the 2nd line in the table above reveals, while the LFPR is up, it’s still well below 63.5%. The population growth rate is a little faster, so that makes a difference, as does the first factor in the table, which is just a conversation factor to go from the HH survey numbers to the payroll ones. But there’s another important capacity change, unforeseen by many: the climbing of the prime-age (25-54) employment rate and LFPR. Neither are back to their pre-recession peaks, but especially the prime-age employment rate is clawing its way back. In fact, prime-agers have recovered 4.4 out of 5.5 percentage points, or 80%, of their decline over the course of the recession. Prime-age men, whose employment rates have suffered a longer-term decline, have made back 76% of their loss; women have done better, clawing back 90%. OK, caveat-time. 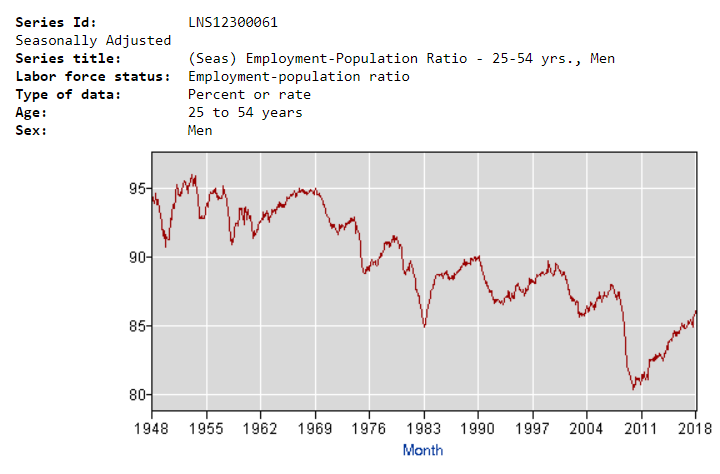 As noted, while the cyclical part of the prime-age guys employment rate looks better than expected, the structural decline is real (see figure below). That said, I’m increasingly off the mindset that separating structural from cyclical is yet another area where economists are fuzzy (this great Yagan paper underscored that point for me). Be careful about writing people off; the reach of really strong labor demand may pull more people in than we tend to think. Also, while payrolls continue to chug along posting numbers that are about 2x of most economists BLs from a few years back, in percentage terms, their growth is decelerating, from around 2% back in 2015 to around 1.5% now, much as we’d expect as we close in on full employment, whatever that much-sought-after state looks like. But the punchline remains: the fact that we’ve been adding an average of ~200K jobs a month, while unemployment sticks around 4%, along with, importantly, tame wage and price outcomes, means that we must not yet be at full employment. Share the post "Employment Breakeven Levels: They’re higher than most of us thought"
11 comments in reply to "Employment Breakeven Levels: They’re higher than most of us thought"
Frankly, I am not sure the wage outcomes are so tame. The Boomer retirement surge since 2006(where you can start seeing it on the graph) has created a “wage paradox” where the loss of senior management has created a faster than in the past move upward the management/sup chain. This creates the distortion despite the raises to new positions, they can’t match their former senior’s salary until the permanent raises kick in. If you look at entry level, wages are rising at the same pace as before the reason in the first quarter of 2018, the first time since that expansion. Inflation is also no longer “low” and will accelerate a bit more over the course of the year. As for unemployment, I suspect we are seeing the last “wave” of the recovery take place late in 2017. I suspect unemployment to decline the rest of 2018 while job growth slows farther based on the entry level wage growth back to 3.5%. 120,000 Jared, only keeps up with population, like 200k did back in 1999. That means over the longer term, if unemployment stays in that range and cohort factors are flat, unemployment would probably stay the same. You need to get up more to 150-200K for unemployment to drop over the longer term. Likewise, prime age employment will continue to rise as long as the expansion does, because cohort factors demand it. Even if job growth slows to 120,000. Empirically we know the high water mark for emp-pop ratio was late 90’s when we hit about 85 percent for 25-54 year old cohort. When we get close to that we will be pushing up wages, before not so much. Other than that – I agree with your comment. Which tops out at 84.6%. We are currently at 82.1%. A very large number of workers dropped out of the job market during the great resession and they remain on the sidelines. It seems most likely that the measured unemployment rate will be irrelevant to inflation until we pull the majority of those people back into the job markets. There’s no upward pressure on inflation because total wages (and therefore buying power) are still way below the trendline. Given the output capacity of the global supply chain, there just aren’t enough wages in the US to consume the goods, and increasingly they can’t consume the domestic services either. I was dismissing the unemployment rate back in 2004 as looking at the employment to population ratio struck me as more informative. Yes – there may be various reasons why the labor force participation rate has declined but this discouraged worker effect is still a major player. We need more aggregate demand on a global scale! I completely agree. I also contend that we cannot get more aggregate demand on a global scale sufficient to create inflationary pressure (which I would argue is good for everyone) without raising wages globally. The very specific nations that MUST raise wages are the US and China. I believe that even if we rise above previous employment participation ratios, the lowered US median wage due to the replacement of manufacturing with Starbucks and the like (services for the relatively wealthy classes) will probably prevent inflation ad infinitum. Advocates of economic integration knew there would be problems, and they also knew that they didn’t know what those problems would be. Well, here they are. Why won’t the advocates admit this is what they prayed for? Why won’t they admit they don’t know? I told you so. On these very pages (see link below) Feb 10, 2018, but also comments going back to 2016 and probably further back but that’s what I could google just now. It is now 82.1 no more than 1/3 of the way back to normal. If 120,000 is break even and there are 600,000 prime age left to come back, say averaging 180,000 means another 10 months. Keep in mind there are increases in the labor force that fly under the radar, adding perhaps another 100,000 to 200,000 per year at least. Anyway, without being overtly snarky, I’m left wondering why these numbers are only being looked at now since they’re available to anyone, even me. Employment figures remain problematic because the federal government has not recorded figures on part-time contingent work (self-employed “independent contractors”) since 2005. But 94% of all jobs created since 2005 are part-time low-wage temp “gig” jobs. By 20204, half of all jobs are projected to be part-time low-wage temp gigs. As a point of reference, the estimated pay for one of these typical gig jobs, Uber driver, amounts to $3.37/hr after expenses. Other gig jobs pay much less — Amazon’s Mechanical Turk, for instance, where the typical pay runs under $1.35/hr. When the starving impoverished population of America burns down the cities and hangs the economists, the economists will still be explaining that unemployment is at record lows and the economy is just great.